The 10 GREAT DATES series provides a collection of fun, innovative relationship building activities that are guaranteed to revitalize your love life and strengthen your communication skills! Perfect for married or seriously dating couples. 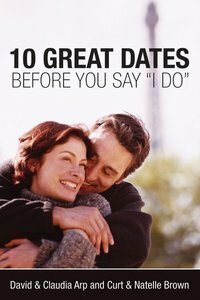 About "10 Great Dates Before You Say "I Do""
10 Fun, Innovative Relationship-Building Dates for Seriously Dating and Engaged Couples!10 Great Dates Before You Say "I Do" combines the best of marriage preparation research with a fun, easy-to-follow format. Couples will love growing together while going out together. Share your hopes and dreamsAppreciate your differencesCommunicate and connectDevelop spiritual intimacyEvaluate your relationshipCelebrate romanceAnd more! Claudia and David Arp, MSW, cofounders of Marriage Alive, are educators, popular speakers, columnist, and award-winning authors of numerous books, including the 10 Great Dates series, "The Second Half of Marriage, Answering the 8 Cries of a Spirited Child", and "Loving Your Relatives". They have appeared as marriage experts on "NBC Today, CBS This Morning, Focus on the Family", and PBS television stations. They have been married forty years and live in Knoxville, Tennessee. Curt and Natelle Brown, MA, MFT, are directors of marriage ministry at Wellshire Presbyterian Church in Denver, Colorado, and advisors to the Colorado Marriage Project. They are experienced mentors to engaged couples, marriage coaches to newlyweds, and developers of the Marriage Alive 'Before You Say 'I Do'' seminar. Customer Reviews For "10 Great Dates Before You Say "I Do""
I've walked through this book with several couples as they journeyed into marriage. Each chapter unveils different aspects of the married life, but from a very practical perspective. I think there are greater resources for indepth study, but for the breadth and accessibility, this one is the best. As each topic is set up as a 'date' with pre-reading required, it's fun to work through! The book is designed to be done as 10 dates. The author's kindly give hints as to what kind of date to go on - environment, atmosphere etc. Each 'date' covers a particularly important topic to discuss and work through before marriage. Everything from conflict resolution, commit, family, goals and finance is covered. And some very painful questions that MUST be asked. Our marriage is better because of this. After each date, you and your future spouse fill in some questions and review the answers at the next date. I would recommend this before engagement if possible! We've gifted it to several couples over the past few years. We used "10 Great Dates before you say I DO" prior to and during engagement - It was most helpful in bringing out new aspects to topics already discussed from a totally different angle, and new topics altogether. Getting a Mentor Couple as it suggested - an experienced couple (married 15+years and who aren't your parents!) to have dinner with and discuss tough issues with was also enormously helpful for us. (Our Mentor couple were married 30+yrs with 3 adult children). Focussing on building your relationship - not just preparing for a wedding - and really talking about lots of practical things make this a wonderful marriage preparation resource. We learned to talk and communicate better, the importance of making time for fun and dating, and the discipline of setting aside the "Great Date" times (including preparing the questions each time) were all really good for us and our relationship. Although we're both quite strong in our faith this book is suitable for people of all/mixed levels of faith too. Friends of ours who aren't 'religious' have found it really helpful for their relationship too. We've recommendeded/bought it for at least 8 couples as engagement gifts. Thanks to Emma for spotting it and suggesting we might find it helpful! So if you are preparing for marriage - or are getting close to taking the next step in your relationship - we HIGHLY reccommend "10 Great Dates".